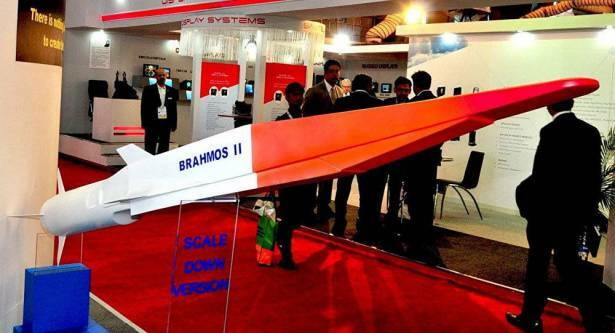 A Russian-Indian hypersonic cruise missile dubbed BrahMos-II, capable of reaching the speed of Mach 7, will be developed in seven years, a BrahMos Aerospace joint venture executive told Sputnik on Friday. General manager for market promotion Praveen Pathak said that an intermediate-range BrahMos-II capable of reaching the speed of Mach 4 is expected within four to five years. Scientific research work has begun with the involvement of the Moscow Aviation Institute and an institute in Bangalore, he said. It was earlier reported that the cruise missile would revolutionize arms industry, though its exact configuration has yet to be defined. ​Currently, the short-range BrahMos flies at the speed of Mach 2.8, Pathak said at the Army-2017 forum near Moscow. The nine-meter BrahMos missile, which was developed by an Indo-Russian joint venture, is one the fastest missiles in the world, has a flight range of up to 290 km and carries a 200-300 kg conventional warhead.